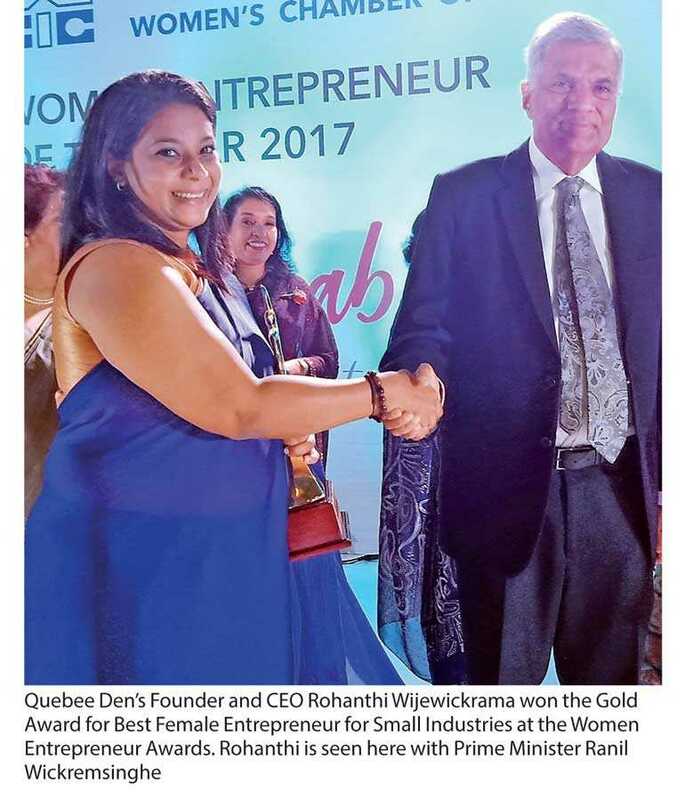 Quebee Den Founder/CEO Rohanthi Wijewickrama has won Gold in the Small Scale Enterprises category at the prestigious ‘Woman Entrepreneur of the Year’ awards. The Woman Entrepreneur of the Year is the biennial flagship event of Women’s Chamber of Industry and Commerce (WCIC), which recognises outstanding women entrepreneurs who change the world. It acts as an impetus for the women’s business community, to improve their business and set up best practices for other women to emulate. This most recent honour caps off an impressive list of achievements for Rohanthi, who has been widely recognised for her successes linked to the family consumer goods manufacturer she founded Quebee Den. Over the past few years, Rohanthi has been invited to represent Sri Lanka at the eighth annual Global Entrepreneurship Summit, held jointly by the USA and India, as well as being tapped as JCI’s Top Outstanding Young Persons of Sri Lanka Award in 2016, while also being adjudged the Western Province’s Best Entrepreneur – Industrial and Manufacturing Sector in 2017 and winning the Best Entrepreneur Award for 2016, both awarded by the National Chamber of Commerce of Sri Lanka. The company has built a powerful portfolio of niche brands like Bellybees, which specialises in food and beverages with no preservatives and Qbee, a dedicated household products brand for non-food items. Catering to all age groups, Quebee Den develops products dedicated to baby, toddler, kids and the entire family has become one of Sri Lanka’s top self-made brands to cater to the entire family, being available island-wide in supermarkets and grocery stores. Quebee Den also recently unveiled 19 all-new products under its Bellybees Infant Food, Bellybees Frozen Pulp, Bellybees Home Bake and Super Bellybees for the Family categories. Introduced on 3 August at the Profood 2018 exhibition, these exciting and unique items include Chickpeas, Mango and Spinach Puree infant food, Simply Amazing Waffles home bake, Spinach, Celery, Apple, Cucumber, Gotukola and Orange drink and Mango frozen juice pulp, to mention just a few.